It was one of those really rare days when you wake up all bright eyed and bushy-tailed, ready to take on the world! I was in 100% productive mode. We had bought bookcases a few years ago. One of them had a cupboard at the bottom. Well those have been moved all over the house more times than I’d like to admit. See I was one of those kids who rearranged her bedroom furniture around at least every month. I know my mom could here the banging, sliding, scraping (sorry about the wood floors mom…) upstairs. I’m one of those strange people who actually LIKES CHANGE, either that or I have serious issues with discontent…. hmmm. Anyhoo, I didn’t like where the bookcase was. It had no purpose, no books on it, and needed to either move out or find a new home (in our home). But I don’t like to waste anything. TIME TO RE-PURPOSE & REUSE! Let’s take that bookcase and turn it into a dining room hutch. I don’t have money for an actual hutch, so this could maybe work! So like I said, I was in total productive mode, moving furniture from one room to another, all my myself. I started to sweat… like terribly but I’m not sure it was completely due to the lugging of furniture… I think I’m entering “The Change”… uhg. I did what most of us (I’d like to think) 40+ women do… shoved 2 napkins in my armpits…. oh yes I did. Hey, Bounty napkins are awesome and very absorbent. So I go about the morning and move the furniture, style and accessorize it, feeling proud of my accomplishments, then I remember I need to run to the grocery store. I stop at the store and pick up what I need and I notice the young, handsome check-out clerk eyeing me curiously. Hmmm, Yah, baby, mama’s still got it! Or…. do I have something in my teeth I wonder? I arrive home, unload the groceries and look in the mirror, still feeling self conscious…. and then I see it…. I have one SWEATY ARMPIT napkin sticking out the backside of my t-shirt arm hole and the other napkin had worked it’s way down and was hanging half way out the back of my shirt, like a flapping piece of toilet paper!!!!!!!!!!!!!!!!!!!! Deep breaths…. oh well. Sometimes you just gotta laugh at yourself. My cupboards were cleaned out a tad and now some of my favorite pieces are stored and displayed on the re-purposed bookcase/hutch. The cupboard now hosts all my place mats and dining room accessories. 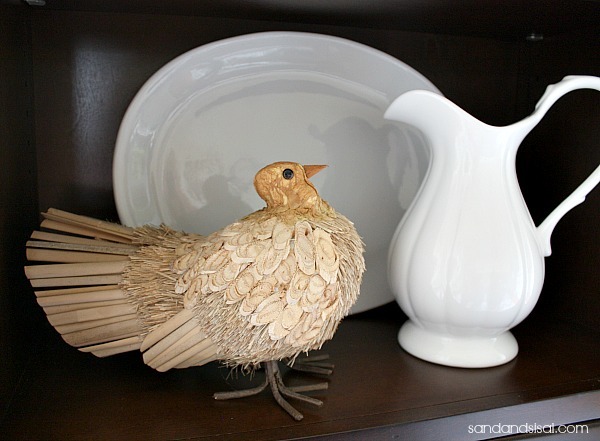 Before you throw or discard any piece of furniture you have in your home, try to think of how to use it differently. Thanks for the giggle and the great example of repurposing and reusing! Haha, You’re welcome! Have a great week Pat! Sorry Kim…didn’t mean to offend with my comment…I tried to deny it too….doesn’t work…lol…hopefully just strenuous activity for you! Oh Sheila! You didn’t offend me in the slightest!!! Well I certainly hoped so girlfriend!! I’ve loved you for years!!! ha! Thanks for taking the time to comment Laurie! Well its a good thing your married cause younger dudes like us older women with bounty towels hangin out!!!! Love the laugh and how fab your shelves work. It was all worth it! oh my gosh, Kim…you had me laughing out loud!! yes, I’m 45 and I sweat at the drop of hat too..I think it’s gotta be “the change.” I sometimes tuck my shirt tail under my bra to absorb sweat…or take my shirt off. Hopefully, I’ll remember to put it back on if I have to run a mid-project errand. 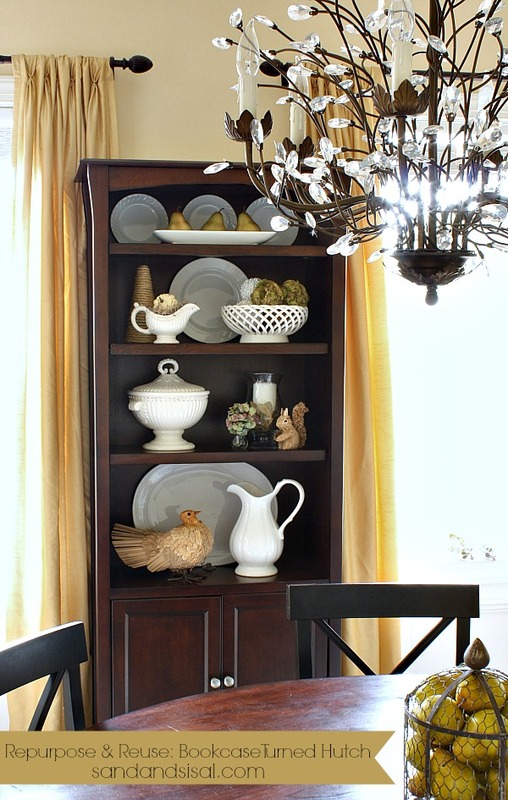 The bookcases look fantastic as a dining hutch. Did you add the doors or were they already part of the bookcase? Oh you are hilarious Sharon! Yes, the doors were already part of the bookcase. I needed that laugh today. I used to be better about reusing…..I am going through the change…I need to look at things with a new eye, to repurpose…If I can just remember where I put it last!! Oh… my … gosh… now I’m totally cracking up! Yes! What is it with memory? I feel so ditzy sometimes. Thanks Sandy! Very nice re-purposing project! 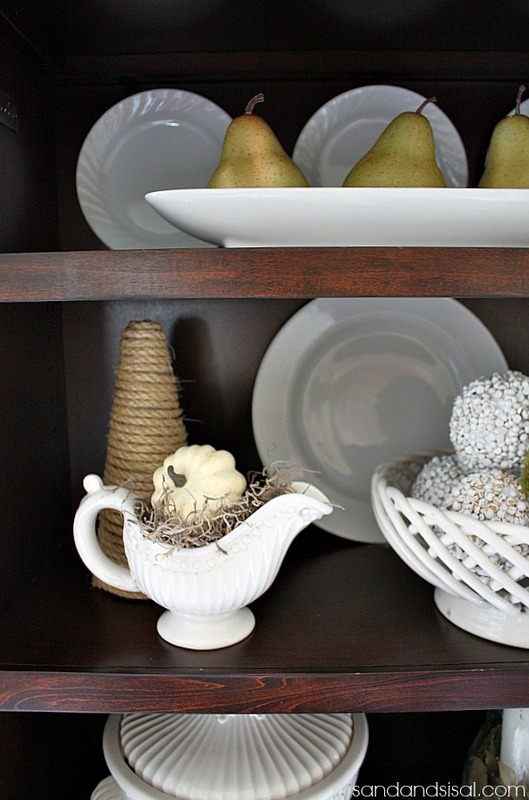 And I love everything ON your hutch shelving too! LOL!! Looks great Kim and I love the pretty displays! Totally had to LOL — those “sweaty days” are the worst but you didn’t let that slow you down! Hutch/bookcase looks awesome — winning! Thanks for the morning laugh! Too funny! We are kindred spirits, you and I. Furniture is meant to be moved. Often. Right? I love rearranging the living room and bedrooms, and thankfully my boys are so excited to walk into “new” bedrooms after my afternoon of rearranging them. Haha! Now I’m wondering if I should change out my dining room hutch (which resides in our living room) into a book case. Re-purpose! Thanks for the inspiration. My husband and kids are in for another change of view. Hilarious!!! The vision of Molly Shannon’s Mary Katherine came into my mind as you described your Bounty napkin placement!! :o) Thanks for making my day! Mary Katherine… Haha! Oh lord… at least I didn’t smell the napkins! LOL. Thanks Janet! You made me completely crack up laughing! HAHA! 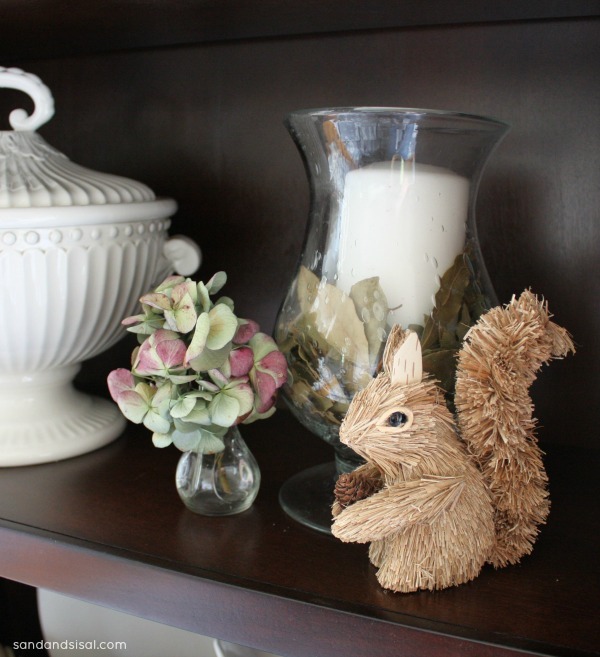 I LOVED the whole event Kim … I am an obsessive “never-ending mover of furniture and décor” myself, so I can relate :). Thanks for sharing the HILARIOUS armpit story too, I needed the laugh! Ha! This sounds much too much like something I would do :). Love you sis and your hutch is styled perfectly. I like it in there. Thank you! I don’t know why I hadn’t thought of it months ago!! I really like it in there now. Oh my Heather! I think I’d die if someone (like the handsome young man) had pointed it out to me! I prefer to live in blissful unawareness… haha! Thank you so much! We just have to laugh, or else we would die of embarrassment, right? Thanks for sharing – I know I am not alone! haha! I could just imagine what he was thinking! Thanks for making ME laugh this morning! So glad to hear! Thank you! And to help all you younger ones out from one who’s been there already, when the symptoms are hitting too hard, visit your local health store and find the cream available to help through ‘the change’. After a surgical menopause, I was ‘different’ overnight, literally! The hot flashing started, but most disturbing was waking wide-eyed every night at 2:30AM on the dot!!! The natural progesterone cream is a life saver in alleviating/reducing the physiological changes because . . . I really did feel like I was goin’ crazy:)!!! haha! Thanks for sharing Susie and thank you for all your tips and advice! I need it! I just found your website and I love it. Not only the crafts but your great sense of humor as well. Thank you for the laugh – I can picture those towels hanging out; ugh, I think it is an over-forty thing to do those crazy things. Thanks for a great site! I fell in love with your chandelier! So much so that I ordered one! I am hoping that you remember how you assembled the crystals. My box came with no instructions! I appreciate any help that you could offer. Take a crystal and place it in branch end . Then insert the silver “pins” trough the metal “leaf”, then through the crystal, then through leaf on the other side. Pinch all the leaves tightly closed around the crystal. Use needle nosed pliers to create a little circle. It sounds complicated but it’s easy, just tedious. (I’ll try to take a close up pic and email it to you later today).